When my children were very little, we had many special bedtime rituals. My daughter in particular had a routine she did not like to deviate from, including specific books to be read over and over (to this day I can recite “Goodnight Moon” from memory) and a nightly dialog that we exchanged. The good-night dialog always started with me, standing with my arms opened as wide as they would go, telling my daughter, “I love you thiiiiiiiiis much!” She would then repeat the motion and the words to me. That’s the phrase that came to me immediately as I baked Honey Graham Bears. The little bear is stretching out his paws to show how much love can fit between them. 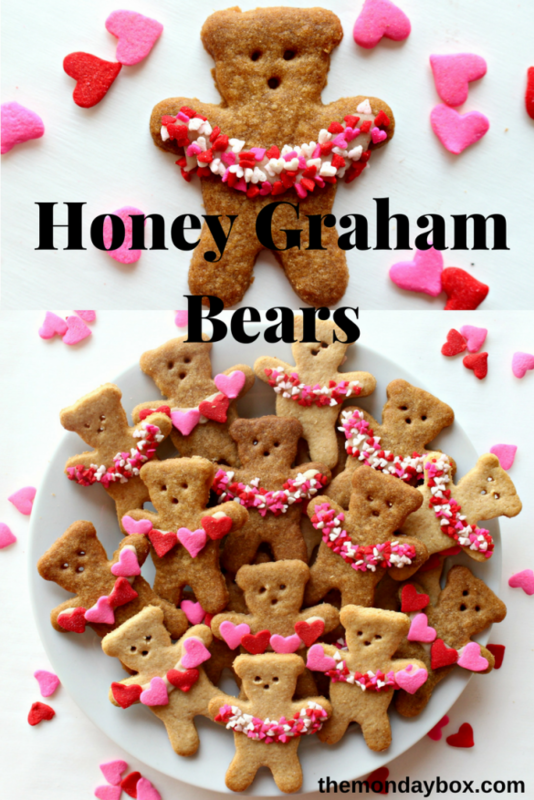 There are so many fun plays on words that can be used with Honey Graham Bears. I sent these cookies in a final military care package to Soldier L. whose deployment is ending soon. The theme of my box was “Thank you beary much!” I wanted to be sure that Soldier L. knows that he is “beary special” to me. I made two versions of Honey Graham Bears, and liked them both. 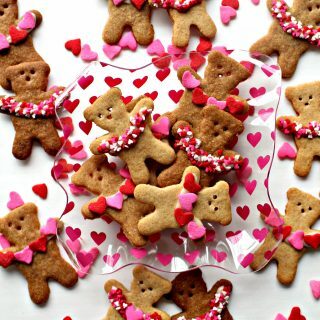 The darker bears are made with brown sugar, using the graham recipe from Honey Graham Sandwich Cookies (using white whole wheat instead of regular). They are a little sweeter with more honey flavor, than the lighter bears. 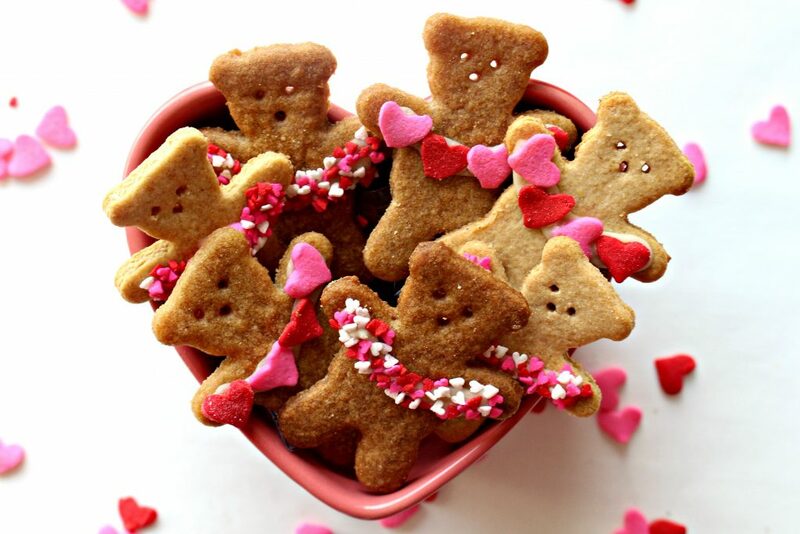 The lighter bears (recipe below) are made with granulated sugar and include oat flour as well as white whole wheat. They are a touch more crisp (less moisture in the recipe) with a milder flavor. Because I believe there is beauty in diversity, both versions of Honey Graham Bears were included in my military care package. A note about whole-wheat flours: Whole-wheat and White Whole-wheat flour are both made from all three layers of the wheat berry, so they have the same nutritional value. Whole-wheat flour is made from hard red wheat. It has a nutty taste. White Whole-Wheat flour is made from hard white wheat. It has a milder, sweeter taste and a lighter color. The two flours can be used interchangeably in recipes. I think it’s so important to let family and friends know they are loved and appreciated, not just on holidays, but all the time. 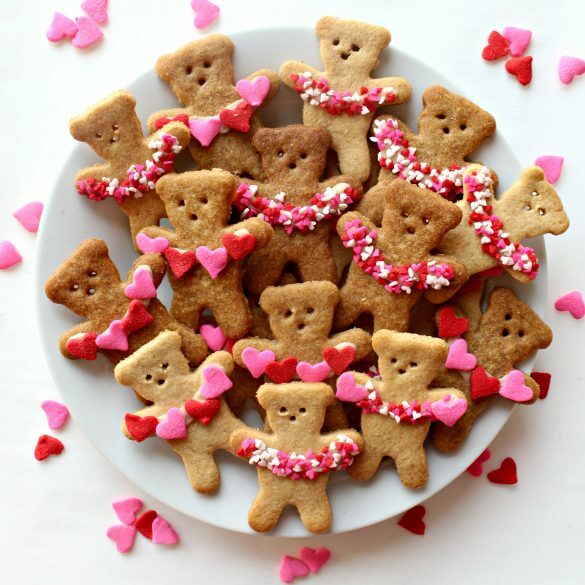 Bake some Honey Graham Bears to let the special people in your life know how beary much you love them! In the bowl of an electric mixer, add flours, sugar, salt, baking powder, and baking soda. Whisk to combine. Beat in butter cubes until a crumbly mixture forms. In a small bowl mix milk, honey, and vanilla. Add the liquid to the flour mixture and mix until the dough comes together in a ball. Flatten the dough into a disc, wrap in plastic wrap, and refrigerate to firm slightly (about 30 minutes). Cut two sheets of parchment paper to the size of your baking sheet. Remove the dough from the refrigerator. Working with one half of the dough at a time, place between the sheets of parchment. 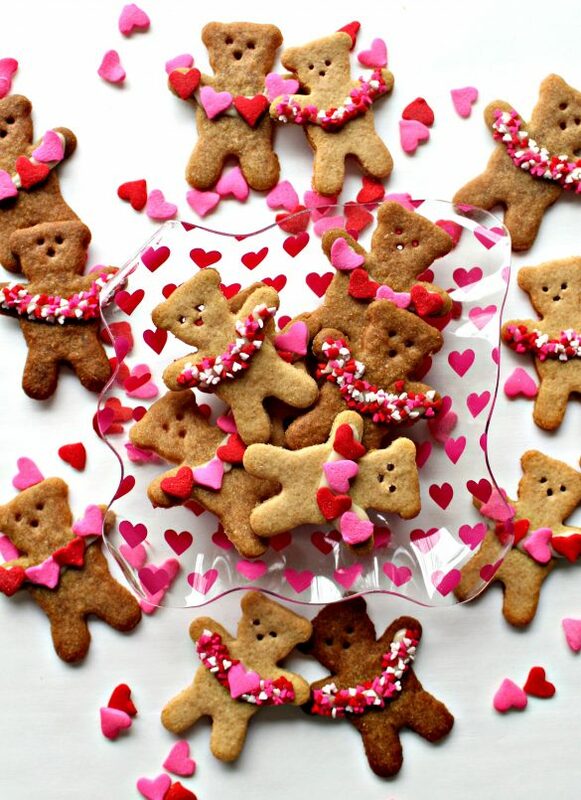 Use a bear cookie cutter to cut out as many cookies as possible. Transfer the cookies to a parchment lined baking sheet, or remove excess dough between the cookies, and slide the parchment, onto a cookie sheet. The cookies don’t spread, so they can be close together while baking. Use a toothpick or skewer tip to poke eyes and a nose onto each bear. Bake for 7-9 minutes, until edges turn golden brown. To prepare Honey Icing, in a small bowl, mix together the honey, vanilla, milk, and confectioners’ sugar. The icing should be the consistency of white glue. Adjust the consistency as needed by adding a bit more sugar for thickening or milk for thinning. Pour the icing into a ziplock sandwich bag. Cut a small piece off a bottom corner of the bag for piping. 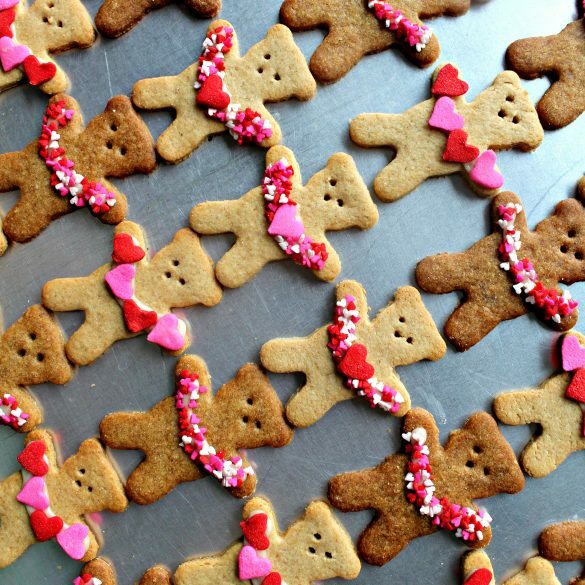 For each bear cookie, pipe a line of icing from paw to paw then add heart sprinkles to the wet icing. Allow the icing to dry completely (several hours or overnight) before storing. Honey Graham Bears can be stored in an airtight container at room temperature for at least 3 weeks. Honey Graham Bears will keep fresh in an airtight container for 3 or more weeks. To prevent breakage as well as aid freshness, I wrap bundles of 2 graham bears (backs together) in plastic wrap, then place the bundles in a freezer weight ziplock bag or airtight storage container for shipping. Awww, these are sooooooo cute Wendy!! I can hardly stand it. These are so adorable! Thanks, Jessie! I am glad I am not the only one who could hardly stand the cuteness! 🙂 These little guys made my day. These are adorable. Perfect for my Baylor Bear!! Pinning to my College Care Package board and my Sic Em Bears board. Thanks, Laura! What a great idea to use Honey Graham Bears as Baylor mascot bears! Maybe holding a green and gold garland? Those would be sure to cause smiles!! I saw these on Facebook and had to pop over and tell you how adorable they are! Another amazing recipe Wendy! Aww, so darn cute. Too cute for words! I love these little bears and love your story too! Thanks, Chris! Mini cookie cutters are the secret to cute cookies, I think. I couldhappily have a menagerie of tiny bears, bunnies, squirrels, and hedgehogs! 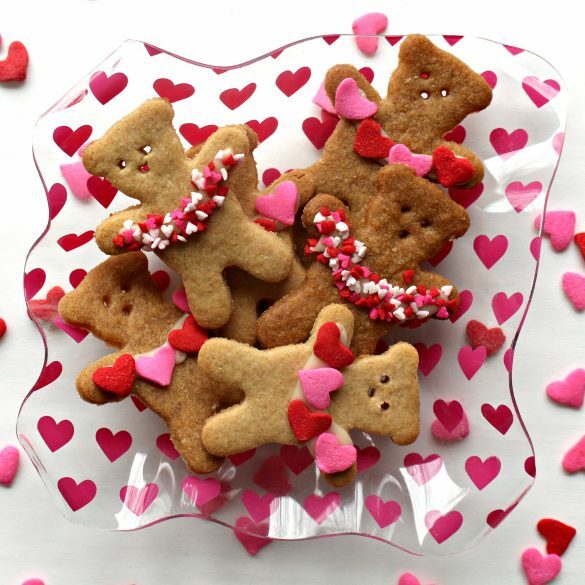 Wow, those bears are cute and perfect baking for Valentines, Wendy. We made colorful Valentines Pretzels with the kids today. If I saw your post earlier, we could have tried the bears too. Beyond adorable. 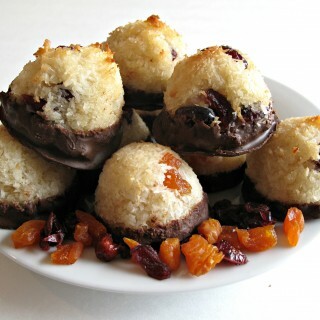 I have seen the almond hugging ones, but I like these soooooooo much more!! Your story of bedtime routines took me back to my own with my kids and I started to feel kind of old. Where did the time go? These are just the cutest little bears ever!! Thanks so much for sharing it with Full Plate Thursday. Have a great week and come back to see us real soon! These are absolutely adorable! I can see using them for for multiple occasions, we’re big teddy bear fans over here! Thanks for sharing! Pinned! I love these!! Thanks for sharing at the What’s for Dinner party! these jus look adorable! perfect for Valentine’s Day or for kids. I am confident that soldier L will always be grateful for receiving this special gift. They are almost too pretty to eat. Thanks for sharing with us at Merry Monday.